> Oracle PaaS/IaaS/Hardware > White paper: Is Your IT Infrastructure Roadmap Meeting Your Evolving Business Strategy? Growth in data-driven business strategies give IT leaders both opportunity and challenges in building a roadmap for success. 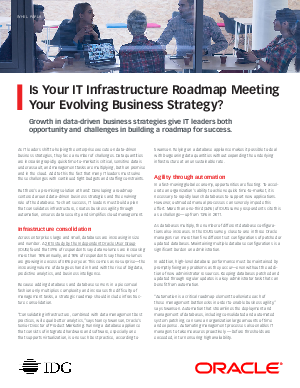 Download the white paper to learn more about critical considerations as IT leaders align and support changing business strategy with the right IT infrastructure roadmap.